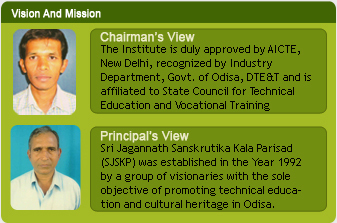 Sri Jagannath Sanskrutika Kala Parisad (SJSKP) was established in the Year 1992 by a group of visionaries with the sole objective of promoting technical education and cultural heritage in Odisa. The Institute has its own campus. It is located just at the end of Phulbani town and besides the Government I.T.I. The Campus is a Pollution free zone surrounded by Lush-green area, Noise free Environment and Hills. The campus is just 2Km from the Town Bus Stop. Throughout the year the environment in area seems to be very pleasant blessed by the nature and geographical location. The institute has a Central Computer Center fully Air-Conditioned with 60nos. of P4 and Dual Core Computers, 1no. of High Power Server, Scanner, Printer equipped with application and System Software with Internet Facility round the clock for the use of students and staff at the time of requirement. The institute has a well equipped library which offers access to a wide range of Books and Journals. The Library at present has a stock of about 3500nos. of volumes covering Civil, Electrical, E&TC, Mechanical, Computer Science, Science and Mathematics, Information Technology etc. subjects and more numbers of books and journals are being procured to update the library. The Institute provides separate hostel to interested Boys and Girls. The Girls Hostel is located within the Campus with 120nos. of bed Facility and with in-house hostel superintendent. The students staying in the hostels are provided with well furnished rooms, adequate security and supervision, transport facility and excellent messing facility. The institute has its own Bus service and provides transportation facility to the students and staff within the Phulbani town at a reasonable cost. The institute has a canteen inside the campus. The canteen provides good quality nutritious foods through out the year. BPIT, Phulbani extends health care for students and staffs with the service of local Physicians and a In-house Pharmacist to look after the health requirement of the students and staff. BPIT has constituted a sports cell with the aid and advice of qualify and experienced coach and sports man, which through various out door and in door games keep the students physically and mentally alert. The cell is being headed by a Senior Faculty and 3nos. P.E.Ts. The students of BPIT Phulbani are also being encouraged to take part in various cultural activities like Music, Drama, Debating, Quiz, One act play, Song Competition etc. The cell is headed by a senior Faculty member. Powered By Sai Paramount IT Solutions Pvt. Ltd.